Get out and explore the great outdoors this Fall! With the leaves beginning to change, now is the perfect time to enjoy the crisp fall air. 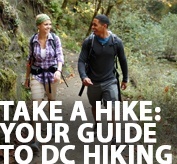 Sport&Health wants you to be prepared for hiking this Fall - our team has put together a guide to get you on the right path! 1. Hiking Shoes – A good pair of shoes are essential for protecting your feet. Be sure your shoes match the terrain of your hike. 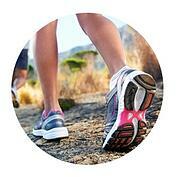 Sturdy cross trainers are sufficient for hikes that have well worn trails. For hikes that are off the beaten path, look for a steel-toed boot. 2. Water – Bring enough water to cover your entire hike. For shorter hikes (2-3 hours) bring 24-32oz of water. Longer hikes may require a hydration pack. 3. Snacks – It’s a good idea to pack a couple of snacks to refuel when you’re feeling tired. Granola bars with added protein will boost your energy and fill you up until you can eat a real meal. 4. Clothing – Dress in layers! This time of year brings fluctuating temperatures – it may be chilly in the morning but warm up once the afternoon rolls around. Look for moisture-wicking fabrics, commonly found in active wear, to help you stay cool and dry. 5. Sunscreen – Even though your trail may be protected with trees, you’re still at risk for sunburn. Layer on the sunscreen before you start your hike and consider reapplying mid-hike. 6. Bug Repellent – Go one step further in protecting your skin – spray on some insect repellent! 7. First Aid Kit – It’s better to be safe than sorry! Bring along a small first aid kit with band-aids, antiseptic wipes, an Ace bandage and other essentials. 8. Backpack – With all of this hiking gear, you’ll want a reliable backpack to protect and carry your belongings. Make sure your backpack is well-fitting to prevent injuries to your back.